'Brown Lasso' (Eugene Buckles by David Niswonger, selector. R. 1972). Seedling #B71-15. BB, height 22" (56 cm), Early midseason bloom. Standards deep butterscotch; falls light violet with sharp edging of medium brown; yellow beard. 'Punchline' X seedling #B69-29: ('Wild Mustang' x 'Milestone'). 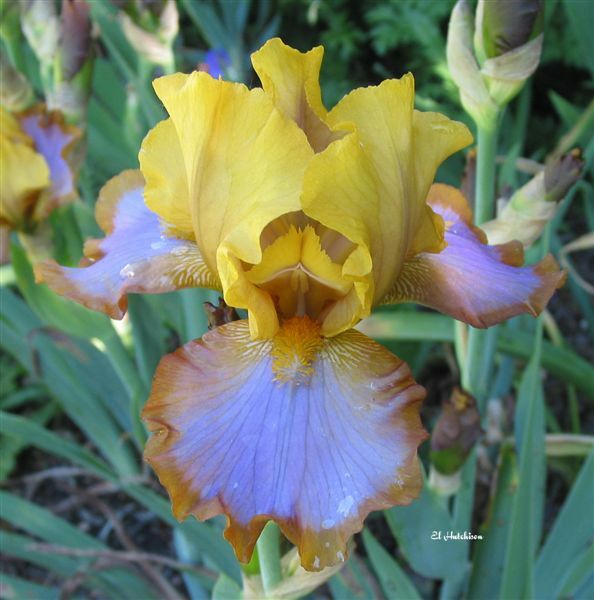 Cape Iris 1975. Honorable Mention 1976; Award of Merit 1978; Knowlton Medal 1980; American Dykes Medal 1981.
jpg 20170609_110922BB Brown Lasso.2.jpg manage 113 K 26 Apr 2018 - 15:05 HollyJohnson2017-04-01 Photo taken by Holly Johnson at the Minnesota Landscape Arboretum, zone 4b on 6/09/2017. jpg BHP_7255-X2_brown_lasso.jpg manage 155 K 17 Feb 2016 - 10:49 BrockHeilman Please contact Brock Heilman for image use. JPG brownlasso01.JPG manage 47 K 28 Nov 2014 - 04:00 Main.TLaurin Photo by Don McQueen,London, Ont. Canada Zone5. JPG brownlasso02.JPG manage 57 K 28 Nov 2014 - 04:02 Main.TLaurin Photo by Don McQueen,London, Ont. Canada Zone5. JPG brownlasso03.JPG manage 44 K 07 Jun 2014 - 20:19 Main.TLaurin Photo by Don McQueen,London, Ont. Canada Zone5. JPG brownlasso05.JPG manage 52 K 19 Jul 2015 - 02:56 Main.TLaurin Photo by Don McQueen,London, Ont. Canada Zone5. JPG brownlasso06.JPG manage 50 K 28 Nov 2014 - 04:04 Main.TLaurin Photo by Don McQueen,London, Ont. Canada Zone5. JPG brownlasso09.JPG manage 73 K 06 Aug 2015 - 22:11 Main.TLaurin Photo by Don McQueen,London, Ont. Canada Zone5. jpg brownlasso7.jpg manage 38 K 19 Nov 2018 - 03:55 Main.TLaurin Photo by Iriszkert Szasz-Hungary.